If you can find the unassuming Franklin Automobile Museum in Tucson, Arizona, congratulations are in order. It’s tucked away in a residential neighborhood north of downtown that chose not to have their streets paved when that was an option. 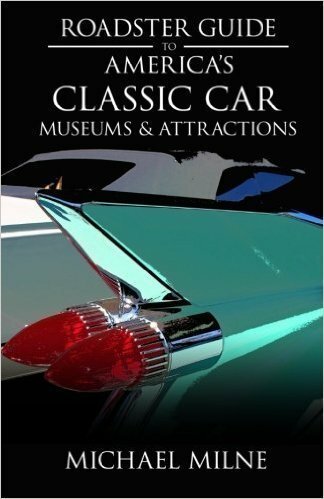 So plan to drive on some sandy roads dodging cacti for a few blocks before you arrive at the museum’s three adobe buildings, which is really part of the fun when viewing such a fine assemblage of pre-World War II cars. This 27-car collection of Franklin automobiles grew out of the passion of one man, car restorer Thomas Hubbard. (Legendary collector Bill Harrah was among his resto clients.) He purchased his first Franklin in 1950 and never stopped. His love affair with Franklins began earlier at age eight when his family acquired a brand new 1933 model; although he soon had to defend his love of Franklins to his friends. Bill, a guide at the museum who as a child used to hang around helping Hubbard’s auto restorations, recalls Hubbard saying, “They’d rib me about the car. I had to explain to my friends, why if the car was so good they didn’t make them anymore.” Hubbard died in 1993 but the foundation he established funds the museum and its continued acquisition of cars. It recently even bought a 1905 Franklin Model A Runabout with a rare rear-entry tonneau. Being from Philadelphia, I thought Franklins were named after noted inventor and Founding Father Benjamin Franklin, but that is not the case. Franklins were produced in Syracuse, New York from 1902 through 1934 under the guidance of engineer John Wilkinson and businessman Herbert H. Franklin, whose personal motto was “It can be done.” He also founded the world’s first machine die-casting business. All of the Franklins were air-cooled. Because air-cooling removed the need for a bulky radiator, Franklin cars took on some unusual front-end shapes including barrel hoods, shovels, and horse collars. Pricewise they ran just under a Cadillac; although over 150,000 Franklins were produced, only about 3,500 survive today. There are three rooms’ worth of autos here. Because early cars required constant maintenance, the 1918 Franklin Model B Touring came with tool kits; the originals are cleverly hidden inside the front doors, with extra spark plugs to boot. See if you can find the handy (and surprisingly small) golf bag on the 1929 Franklin Convertible Coupe. In a sign of the times, with Charles Lindbergh having crossed the Atlantic Ocean (with an air-cooled engine) just two years before, an airplane logo was placed on the rear bumper to symbolize the car’s “airplane-type” engine; further increasing its sportiness factor. It’s not all Franklins here though. In an outbuilding there are several other marques, including a 1909 REO Touring, which was the first car Thomas Hubbard restored. A 1929/1930/1931 Franklin Model 153 is unique because it was company founder Herbert Franklin’s personal vehicle. The reason it has so many model years attributed to it was that he brought it into the shop annually to update it to the current model year. A one-off 1931 Franklin Model 153 Sport Phaeton was custom ordered by 21-year-old Stillman F. Kelley, II for his honeymoon. Despite the Great Depression raging, Kelley was able to pay $6,500 for this beauty, and may have survived the financial downturn better than Franklin. The automaker had leveraged his company for growth that didn’t materialize and was unable to shoulder the increased debt burden, declaring bankruptcy in 1934. The aircraft engine division survived but, in an odd twist, was bought in 1947 by Preston Tucker to produce engines for the Tucker 48. Highlights: 1905 Franklin Model A Runabout and a one-off 1931 Franklin Model 153 Sport Phaeton. Location: 3420 N. Vine Avenue, Tucson, AZ 85719. (Mailing address in 1405 E. Kleindale Road, Tucson, AZ 85719.) Note: Nearby is one of the original muffler men statues. Hours: Mid-October through Memorial Day: Wednesday through Saturday, 10 a.m. to 4 p.m. Note: Closed the rest of the year, it’s just too hot!